ST LUCIA CRISIS CENTRE is celebrating its 30th anniversary during the month of October as it continues to take progressive steps towards making a quantum leap in addressing the need to combat abuse, prevention of breakdown of the family unit among others. The Centre is organising a Walk named ‘A La Wout Se’ Tje” as one of its activities in collaboration with the St. Lucia Blind Welfare Association – A WALK WITH A DIFFERENCE SCHEDULED FOR SUNDAY NOVEMBER 04, 2018. This Walk will culminate the 30th anniversary activities and is expected to raise funds to support the services of the two charitable organisations that will assist in addressing their many dire needs. We are targeting one thousand persons and the proceeds of this activity will be shared between the two institutions. The Folk Research Centre has incorporated this event in its Creole Heritage Month of Activities. 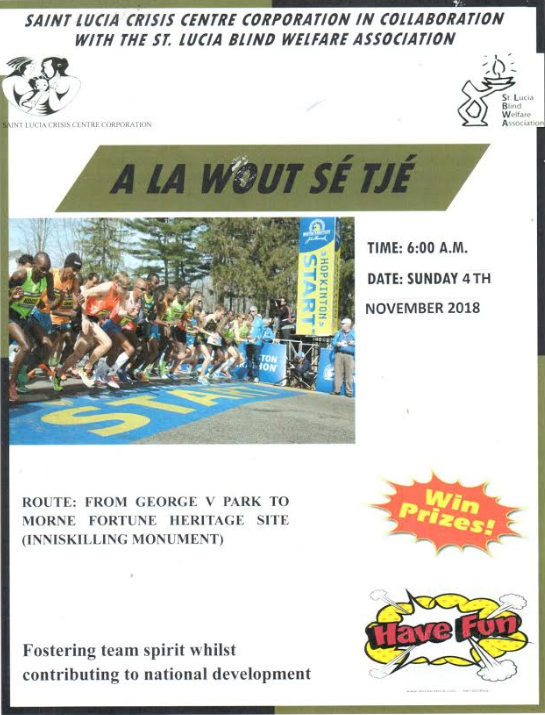 ASSEMBLY POINT – GOERGE V PARK FROM 6:00 A.M.
ROUTE COMMENCES FROM GEORGE V PARK THROUGH LA TOC ROAD TO INNISKILLING MONUMENT- HERITAGE SITE, MORNE FORTUNE AND BACK THROUGH OLD VICTORIA ROAD INTO GEORGE V PARK WHERE THE WALK CULMINATES. The St. Lucia Crisis Centre and St. Lucia Blind Welfare Association are eagerly looking forward to the participation of all in the A LA WOUT SE’ TJE’ Walk.